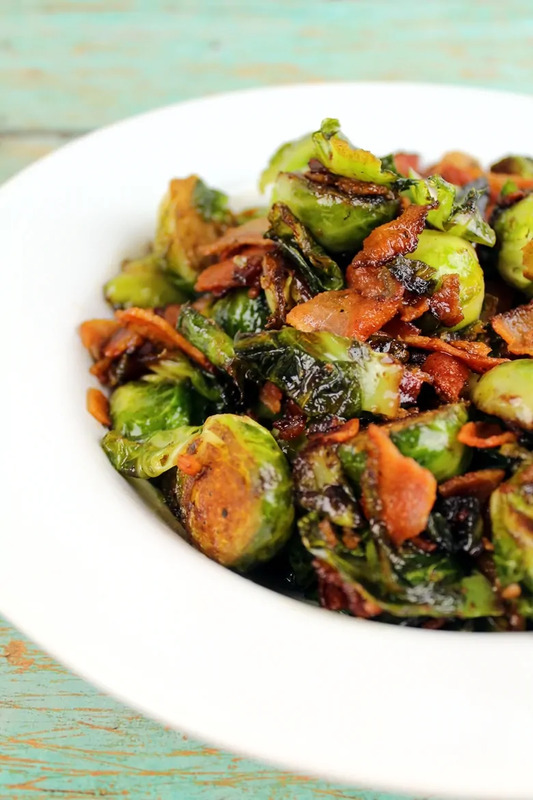 Brussel sprouts with bacon and balsamic reduction makes a delicious and easy side dish. These are seriously the best brussels sprouts ever. Are you looking for a side dish that’s a bit fancier than what you normally make? Perhaps even something that you don't grab from the freezer and microwave (no judgement, this is how we make veggies most nights)? If you ready to kick your side dish game up a notch, I have the perfect recipe for you. 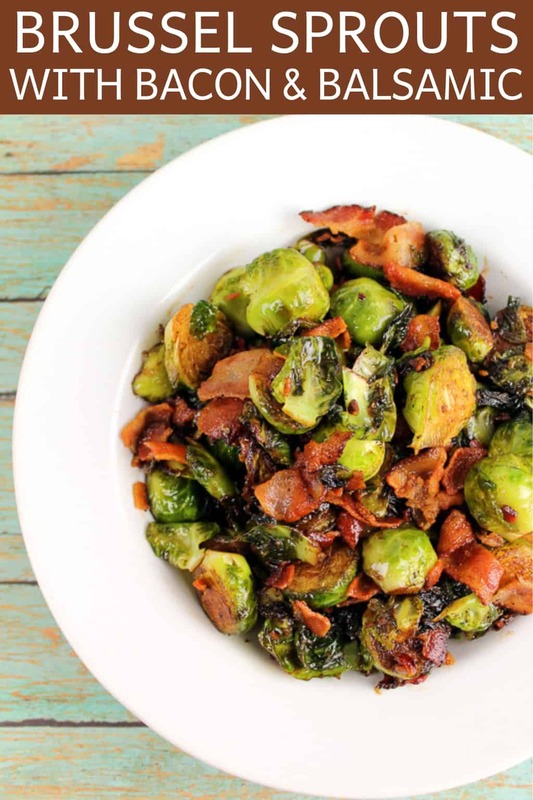 These crunchy brussels sprouts with bacon and balsamic reduction make for a wonderful side dish to accompany any meal. I especially love making this brussel sprout side dish for special occasions and holiday meals. Whether you’re serving spiral ham, turkey, or standing rib roast, this side dish will compliment it perfectly. The dish is also great for bringing to a holiday potluck. Don't get me wrong though — brussel sprouts with bacon are great as an everyday side dish as well. 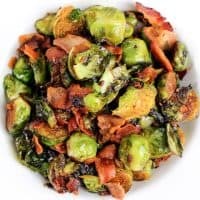 What makes these bacon brussel sprouts something that your family is really going to enjoy is that special ingredient — bacon. Bacon makes everything better. Everyone loves the salty, smoky flavor of bacon. Plus, it can be a great way to help change up the flavor of the brussel sprouts. The balsamic reduction also adds a tangy, slightly sweet addition that really makes the dish pop. The real key to this recipe is to not overcook the brussel sprouts. Not only do Brussel sprouts taste better when they have a bit of crunch left, but you need to avoid overcooking them or their flavor will be too strong. I hope that you and your family enjoy this amazing side dish recipe! Brussel sprouts with bacon and balsamic reduction makes a delicious and easy side dish, perfect for holiday dinners and potlucks. Prepare the balsamic reduction by adding balsamic vinegar, sugar, and a pinch of salt to a medium-size saucepan. Cook over medium heat until the volume reduces by half. Remove from heat and set aside. Cook bacon in a cast iron skillet until crisp. Use a slotted spoon to remove bacon. Set bacon on paper towels and allow some of the grease to absorb. Add brussel sprouts to the rendered bacon fat. Add parsley, salt, and pepper. Stir to combine. Cook brussel sprouts until they are tender on the inside and crisp on the outside. Drizzle desired amount of balsamic reduction over brussel sprouts. Stir gently to combine. Crumble the bacon and add to the brussels. Shared on The Weekend Potluck and Meal Plan Monday. I’ve literally never tried a brussel sprout… but I think you may change that. These look YUM!!! Love brussel sprouts but have always just made them plain or with lemon juice. This recipe looks really amazing! 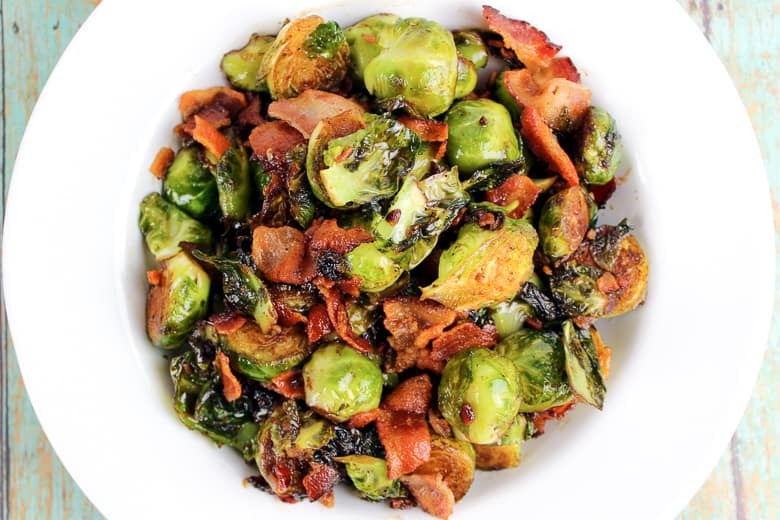 I admit I haven’t found a brussel sprout that I’ve liked, but maybe with a lot of bacon that could change that. Looks good. We love Brussels sprouts and your recipe look so delicious! 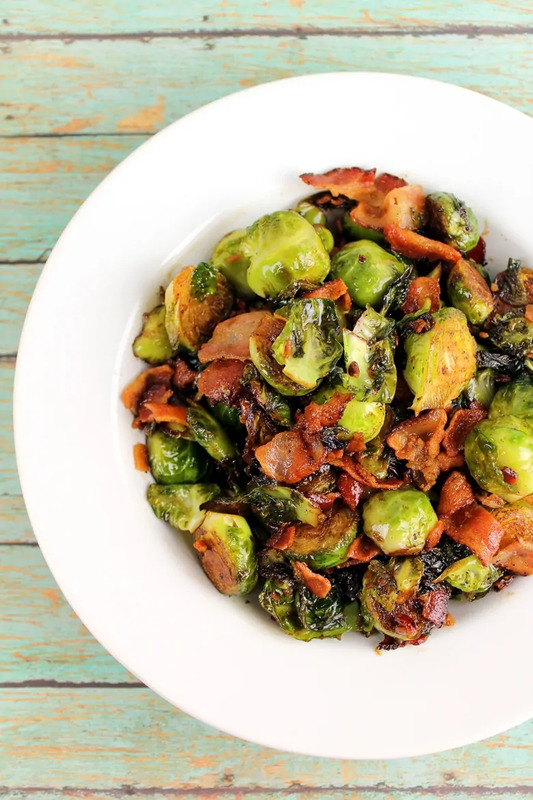 Love brussel sprouts and bacon! So delish together!